Maybe we haven’t seen the last of The Last Town Chorus | Will You Miss Me When I'm Gone? It was a real shock to go through the Will You Miss Me When I’m Gone? photo library and discover that there’s not a single image socked away of one of our absolute favorite bands ever: The Last Town Chorus. And since Megan Hickey, the awesome lap-steel guitar-playing heart and soul of TLTC, stopped gigging nearly two years ago, we had the feeling we might never get a chance to correct that omission. The new tune is worth the wait. Her voice sounds a little different, more natural and a touch less dressed up than on her previous recordings. It’s a voice that’s as beautiful and clear as a bell as possible. She’s retained her amazing ability to bring tears to our eyes in the way few singers can. We’re looking forward to more track, soon! So, with a new song out, can performing be far behind? WYMMWIG is eager to see and hear Megan play again. And other fans are eager too. Megan divorced herself from New York City in a long, slow process. 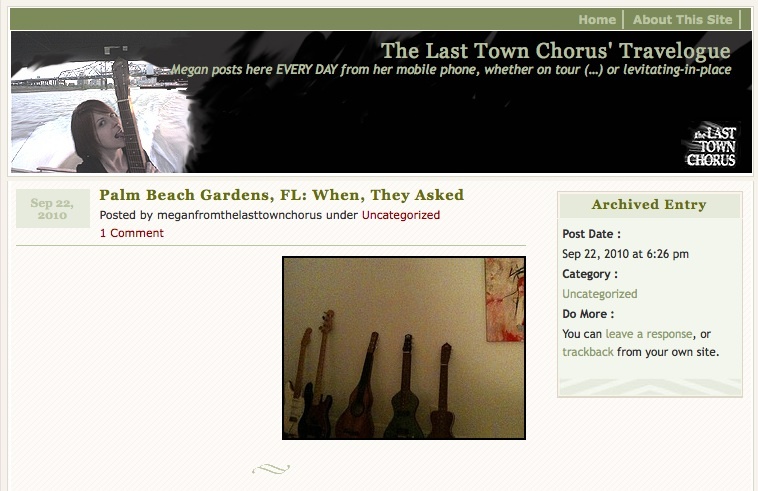 You could track it pretty clearly on her blog, The Last Town Chorus’ Travelogue. She started spending more and more (nontouring) time away from New York in early 2009. She started downsizing, selling equipment and finally gave up her record collection. That was a clear sign she was done, done, done with New York, at least for now, if not forever. But Megan clearly did get the urge for going (as Tom Rush wrote), and so she finally did. We should have seen it coming. We won’t get into her reasons. She’s told us some of them, and we’re sure there are many more. She can explain it herself if she wants to. The reasons don’t matter. What matters is that Megan seems to be finding her muse again. And our lives will be richer as a result. We don’t know what’s next for Megan, and we haven’t yet asked. Chances are, Megan, who’s extraordinarily talented, beautiful and an all-around good person, will let us know soon. Andy maybe we’ll get to fill that blank in our photo library. In the meantime, we have “Keep Burnin’ ” to keep us going. Thanks, Megan. This entry was posted in Country, Folk, Music, News, Pop and Rock, Recordings and tagged Brooklyn, Florida, Megan Hickey, New York City, The Last Town Chorus. Bookmark the permalink.